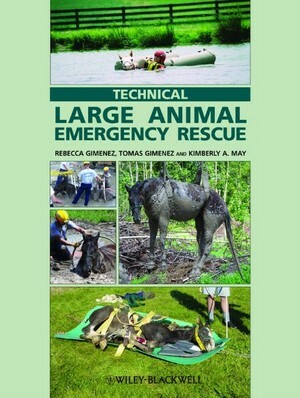 Technical Large Animal Emergency Rescue (TLAER TM) is not disaster medicine. It is not field (ditch) medicine. TLAER does NOT refer to “salvage / rescue” of neglected, starving or abused animals – although many of the techniques may be utilized on those types of scenes or in rehabilitation facilities. It is the practical Considerations, Behavioral Understanding, Specialty Equipment, Techniques, Methodologies and Tactics behind the safe extrication of a live large animal from entrapments (trailer wrecks, ditches, mud, barn fires) in local emergencies and disaster areas. INTRODUCTION TO TLAER at http://www.horsenation.com/2015/04/03/friday-standing-ovation-technical-large-animal-emergency-rescue/ This is a SUPER story about TLAER and what it is - and what it ISN'T. Thank you to sponsor and HORSE NATION for their help getting the word out. Technical Large Animal Emergency Rescue, Inc. offers training nationwide (United States) and internationally for emergency response services, such as fire departments, rescue squads, law enforcement agencies, emergency management, county and state emergency response teams and animal control officers. Consulting is available for departments and organizations trying to put together a Large Animal Rescue program. The TLAER courses are structured to educate even those who are not usual members of a branch of emergency services, such as veterinarians, large animal facility operators, animal rescue organizations, large animal transporters, and large animal owners. Individuals can attend an AWARENESS Level Course as a Participant to receive a TLAER, Inc. Awareness Level Certification. 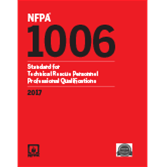 This is the MOST IMPORTANT level to attend for most people – from owners, veterinarians, and fire fighters to animal control / humane officers and law enforcement officers. Recent example : http://www.equineguelph.ca/news/index.php?content=426 at Equine Guelph, Canada. Individuals can attend an OPERATIONS Level Course as a Participant to receive TLAER, Inc. Operations Level Certification. 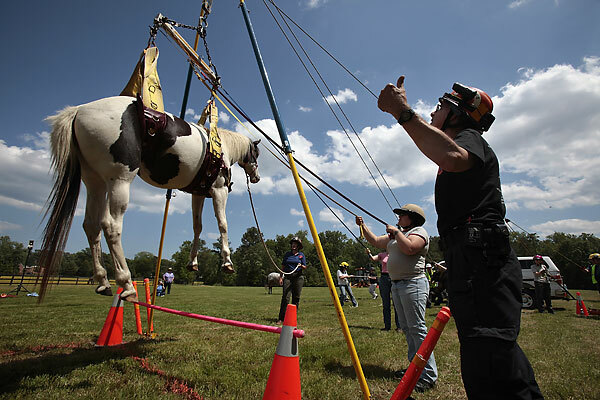 This course is intended for live responders that expect to be deployed to actual live scenes, and involves use of live animals, realistic mannequins, rope techniques, and heavy rescue operations. Individuals taking this course must have previously taken an AWARENESS course in TLAER, as well as online ICS training, and sign a waiver. The TECHNICIAN Level Course is reserved for members of Urban Search and Rescue (USAR) Teams and other highly trained and specialized technical rescue teams. GET THE TEXTBOOK! at Amazon and other booksellers online. 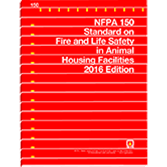 These courses are designed with a concentration on livestock and horses, being the most encountered large animal at an emergency incident; however the term “large animal” doesn’t have a precise definition - commercial livestock, exotic animals, zoo animals, etc. In a TLAER incident…always “Expect the Unexpected” There are stacks of videos, personal accounts, social network photos, and newspaper articles that have been collected by TLAER instructors that testify to the commonality of these types of rescues. In addition to technical rescue operations, the tactics are very applicable to cruelty investigation cases. What does TLAER require that makes it special? Large animals are different – they do not follow rules of physics or chemistry – but instincts of fight or flight under fear and stress. Innovation is often required by rescuers as each incident and rescue operation is different than the last one. Prevention, Safety and Education is a huge theme of the TLAER courses because as animal owners and stakeholders learn to prevent the common types of incidents, focus can be shifted to the unusual and highly technical ones. TLAER as a "Specialty Form of Heavy Rescue" is a new idea within the fire service in the last 20 years, and is gaining ground all over the globe. Over the last two decades, as the occurrence of large animal incidents became more common, branches of emergency services have begun to respond to such calls for service as the public has adopted a "911 Call Does It All" mentality. 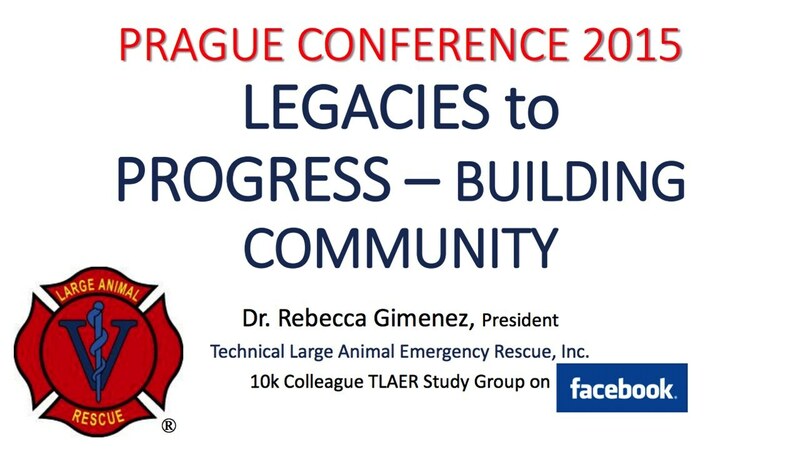 With the increase in the number of incidents involving large animals, the need for specialized training in the field of TLAER was exposed and more people expressed a need for AWARENESS and OPERATIONAL level training within this specialty. What the TLAER training course does is bring together (in two to four days, depending on the training course level) all of the latest concepts, techniques, procedures and equipment being used today. The primary instructors search, communicate and distribute with people all around the world and by doing so they are able to develop innovating tactics, techniques and procedures to share with their students. TLAER, Inc.’s ongoing research and development, focus on simple and practical applications, and with improvements suggested by our highly qualified students. Courses are updated constantly – allowing students to learn the most current methods and equipment in each course. It is highly recommended by TLAER, Inc. that course attendees complete the online courses listed below prior to attending an Awareness or Operations Level Course. Online registration and certification are free through FEMA at http://www.training.fema.gov/IS/ TLAER course attendees at any level will benefit from the knowledge obtained from these topics and will be able to better understand some of the basic, yet vital, components of TLAERTM disaster incidents and emergency responses taught throughout the courses. THE SIXTH INTERNATIONAL CONFERENCE ON LARGE ANIMAL RESCUE was held in PRAGUE, CZECHOSLOVAKIA on 4-6 DEC 2015. Mover and shakers from 12 countries in TLAER / LAR / LART / SART / DART, etc. came together. the BARTA sponsored "Incidents Involving Animals: Managing Risk - Meeting Societal Needs" conference in UC Davis Vet School, California. OCtober 2017. This photo is of Nicole Graham and ASTRO - they were saved in 2012 with a local fire department and veterinarian worked together to get them out of the mud - the FIFTH INTERNATIONAL CONFERENCE ON LARGE ANIMAL RESCUE was only a few hours away from the location in Geelong, Victoria where this iconic couple narrowly escaped a muddy tragedy. More at http://www.telegraph.co.uk/news/worldnews/australiaandthepacific/australia/9111117/Horse-trapped-for-three-hours-in-mud-as-tide-approached.html I was lucky enough to MEET this young lady - she is an amazing person!!!!!!!!!!!!! 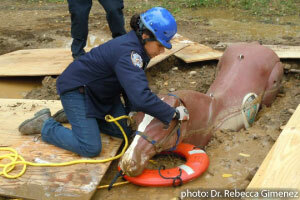 ***** In several locations in the US, there are specific TLAER trained response teams (SEE RESOURCES PAGE) that are available to respond to large animal rescue incidents. Each squad or organization has their own response protocols, equipment cache, and policies. These departments, organizations, and teams have invested in some of the specialized TLAER equipment necessary to more easily perform these rescues. They have in some cases developed and normally follow TLAER Standard Operating Procedures/ Guidelines learned during the course when responding to large animal incidents. Many of them have discovered that their TLAER equipment is useful for moving extremely large HUMAN patients, too = after all a bariatric patient is very similar to the weight of a small horse. Join Randy's family of horses around the world on his own FACEBOOK page at https://www.facebook.com/pages/Randy-Horse-Rescue-Mannequin/110014909076784?ref=ts&fref=ts for Randy Horse Rescue Mannequin. With over 50 of these training horses available in Europe and Australia - the USA now has over 20 of them here - vet schools and TLAER teams are getting interested in providing safe methods of realistic training for awareness students, and ways to practice very dangerous scenarios for the Operations and Technical level. email delphiacres@hotmail.com or join her on FB at the TLAER STUDY GROUP (or see FB link at top of page). The TLAERTM name and the TLAERTM logo are registered trademarks and cannot be used without express permission of TLAER, Inc., by Dr. Rebecca Gimenez. While we encourage people to coordinate and assist with training exercises and events with their local emergency responders, veterinarians, and related personnel to increase the awareness of TLAER methods, procedures, and techniques, we do not allow anyone to use our registered logo, nor the TLAERTM or Technical Large Animal Emergency Rescue trademarked names – it is our intellectual property. Completion of a TLAERTM Certification Course or receipt of a TLAER, Inc. Certification does not bestow upon anyone the title, rank or position of assistant instructor, instructor or anything related to being an educator for or an representative of TLAER, Inc. Please do not pursue the use of our logo, name or website to represent your own business or training events. We will assist you with pictures (free of charge on our website and on the Facebook group) that you can download, and expertise via email. The scheduled courses listed on this website are TLAER, Inc. courses that are instructed by TLAER, Inc. Primary Instructors Dr. Rebecca Gimenez (with the assistance of approved TLAER Assistant Instructors.) Please submit an inquiry to TLAER, Inc. regarding any course that you are considering attending that is not listed on this website, as it may not be a TLAERTM accredited course or approved by TLAER, Inc. Classes offered and instructed by other individuals and entities not affiliated with TLAER, Inc. are not regulated under TLAER, Inc. recommendations, policies, and curriculum. 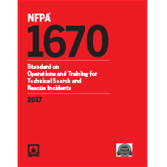 We contributed to the NFPA 1670 Standards (2014 edition) – our courses promulgate these efforts to standardize this area of Animal Technical Rescue. Large animal rescue or save your horse courses that are available to the public under different venues and names are organized and instructed by independent contractors who set their own formats, pricing and schedules. TLAER, Inc. does not regulate nor receive any fees or services from those classes. If you have any concerns or questions please feel free to contact Dr. Rebecca Gimenez at delphiacres@hotmail.com or call 214 679 3629.